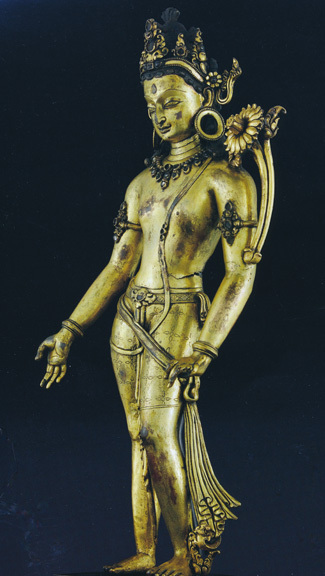 This March 20, 2019 auction at Christie's New York of Indian, Himalayan, and Southeast Asian Works of Art is highlighted by a spectacular Indian anthropomophic bronze figure, a gilt-bronze figure of Padmapani Lokeshvara, a Tibeto-Chinese painting of Vaishravana, and a Tibetan black-ground painting of Mahakala Pamjarmata. Lot 651 is a fabulous abstract anthroporphic figure from the Gangetic Plains in India from the 2nd Millenium B.C. It is 13 3/4 inches high. "This rare work in abstracted human shape has a distinctive dome-shaped head, wide arms which curve inwards, and tapered legs. Although the function of sculptures such as these is unknown, they may have been used for religious or decorative purposes. As unalloyed copper is a soft metal, it is unlikely that these would have been functional as a tool or weapon. Figures such as these were discovered in copper hoards throughout northern India, and have been attributed to an indigenous culture in the Gangetic Basin during the first half of the second millennium BC. 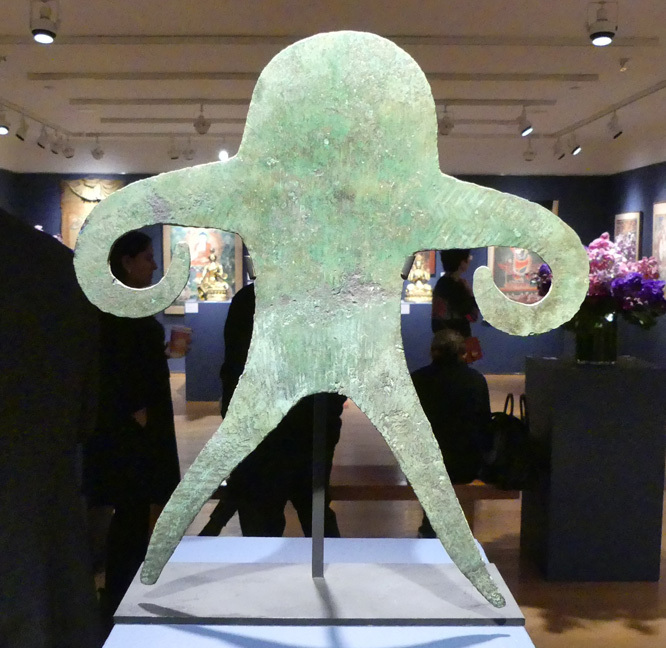 Compare the style and proportions of the torso with one of three additional copper anthropomorphs at the Metropolitan Museum of Art...."
The lot has an estimate of $25,000 to $40,000. It sold for $40,000 including the buyer's premium as do all results mentioned in this article. The auction has a sale total of $4,671,375. Lot 666 is a rare and fine black ground painting of Mahakala Panjarnata from Tibet. The 18th Century work measures 33 by 21 1/8 inches. "Fire surrounds a dwarfish and big-bellied Black Lord of the Pavilion, who stands upon a prostrate human figure pinned down atop a lotus throne, which is barely visible through the masses of carefully-shaped flames that encircle each of the retinue figures who surround him. The viewer’s attention is directly drawn to the bright white teeth that protrude in a fierce manner from the gaping red mouth of the deity and his three bulging red-tinged eyes. Atop his head sits a crown with five jewels and five smiling human skulls. His wild gold hair is topped with a vajra and tied with a small serpent resembling the one delicately-rendered around his belly. His heavy gold eyebrows and tufts of facial hair resemble his jewelry in their spiraling designs. The finely painted details of the jewelry, bone ornaments, protective staff, curved knife, blood-filled skull cup, and tiger-skin, were all clearly executed with the finest brush. Mahakala’s garland of fifty severed human heads is also rendered with incredible detail, each expression distinct from the next and each hair defined. Compare these details to those in an example of Panjarnata Mahakala in the Rubin Museum of Art (see figure a). "The beauty and grandeur of the present painting, however, is not all contained within the central figure. This dynamic composition is a result of creative and expertly-painted details filling each and every space between the wrathful retinue of figures: animals emerge between flames, miniature necromancers, monks, and warriors appear in small vignettes, and implements among a feast of gruesome offerings fill the bottom of the canvas, all in harmony with the terrific mood of the painting. The artist of the present work managed to fit an extraordinary volume of figures, flames, symbols, and ritual representations into the composition, and the black ground creates an all-pervasive dark space from which these forms emerge and coalesce. The sheer number of elements packed into the painting and precision with which the mass of details is executed unquestionably makes this painting worthy of display among Tibetan masterworks." "Tibetan art is known for repeating and replicating the same figures in painting and sculpture. This is understandable when most of the figures are derived from religious texts and Buddhist narratives. The totality of figures can be generally separated into two broad subject categories; teachers (real and mythical) and deities (peaceful or wrathful). In the category of wrathful figures, the subject of Panjarnata Mahakala was exquisitely depicted in painting, and with excellent examples in various museums and important private collections around the world. 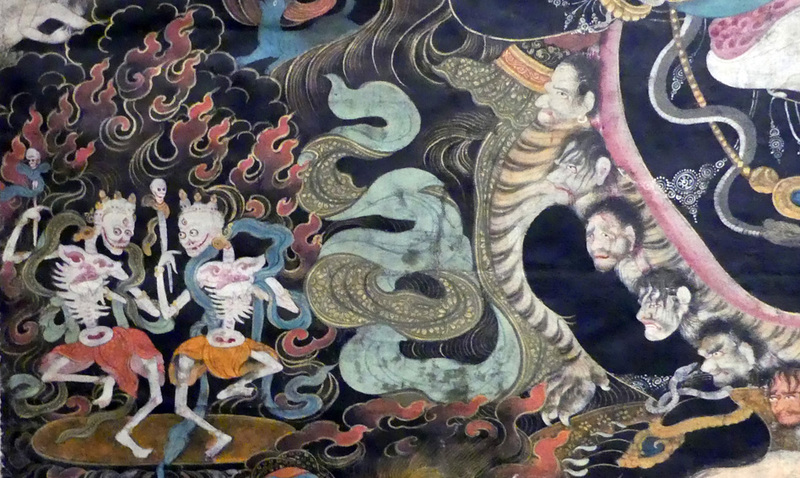 What explains the presence of several finely painted Mahakala Panjarnata thangkas, and why might it be important for the study of Tibetan art? "Panjarnata, meaning ‘Lord of the Pavilion,’ is classified by function within Tantric Buddhism as a protector deity, and within the different Tibetan Buddhist traditions each school had a principal protector. For the Sakya Tradition, founded in 1073, Panjarnata was in the past and remains today, the principal idealized protector of the school. Subsequent to its founding, the Sakya sect was patronized by the Mongols of the Yuan dynasty of China and enjoyed prestige and power. During that time, fine examples of Panjarnata in painting were created for ritual use and gift exchange. Because of the dominance, popularity and power of the Sakya school, many sub-schools were spawned with their own prosperous and powerful monasteries and administrations. Examples of these are the Shalu, Jonang, Bodong, Ngor, Tsar and Dzongpa establishments. Those monasteries became powerful because of broad patronage from wealthy donors and strategic alliances often through marriage between the powerful patron families. For example, the hereditary Khon family of Sakya was related by marriage to the Kushang family of Shalu, the Gyantse royalty and to the Maharajas of Mustang and Sikkim. At various times since 1073 these Sakya-influenced, but administratively independent, schools and monasteries wielded great power and wealth. Based on that wealth, works of art of the greatest quality were created from the twelfth century to the present. Being doctrinally related, several of those great works of art were depictions of Panjarnata Mahakala, the shared protector for all those wealthy monastic houses and related patron families. "This painting of Panjarnata conforms to an established standard in Buddhist hierarchy and the placement of figures in the composition. The placement follows the common adage for such paintings: ‘Big to small, top to bottom, left to right, and inside to outside.’ Panjaranata is the large oversized central figure with a glaring, slightly sideways, wrathful expression. At the top center is a blue deity figure accompanied by the two historical figures of Mal Lotsawa Lodro Drag (born in the eleventh century) and Sachen Kunga Nyingpo (1092-1158). The last two represent the human lineage of teachers. "Descending on the left side are Bhutadamara Vajrapani, blue, with four arms, and Shri Shmashana Adhipati in the appearance of two dancing skeletons. Descending on the right side are Ekajati holding a vase and Shri Devi with four arms, riding atop a donkey. Bhutadamara is the meditational deity (ishtadevata) and the latter three are additional but lesser protector deities within the Sakya tradition. Alternately, the ‘Tsang’ matrix of related religious traditions can be used to refer to the religious streams originating from or relating to the Sakya school and traditions which almost all are based in the Tsang Province of Central Tibet. In the lower third of the composition are five figures known as the Five Activity Protectors. These five, referred to in the liturgies, are a family with a mother, father, and three wrathfully agitated children who as a group function as the special attendants, or servants, to Panjarnata. "Scattered throughout the composition, regardless of the hierarchy of the principal figures, are very small depictions of monks, warriors, black hat dancers, black men and women. In the mass of red and maroon flames surrounding Panjarnata are the forms of birds, dogs and wolves. All of these additional depictions represent the outermost of the retinue of the entourage of Panjarnata. The most important figures are the largest, and the smallest are the least important. The more important of the secondary figures are read from top to bottom. The more important of the subjects are placed on the left side. "The central importance of Panjarnata paintings are related to their age, the wealth of the donors who commissioned the works and the skill of the highly-paid artists over the centuries. 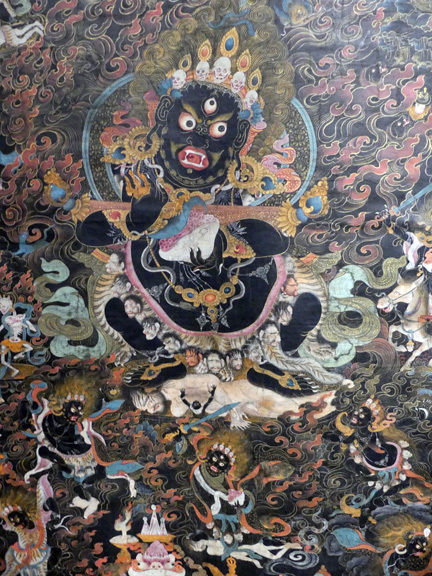 Because of the breadth of surviving fine Panjarnata paintings, it becomes possible to study a great variety of Tibetan painting styles by focusing on a single iconographic subject example – in this case, Mahakala Panjarnata. These examples have been repeated many times and in many different regional areas, providing a wealth of information and different compositions to compare for study and investigation. "The early examples of Panjarnata prior to the fifteenth and sixteenth centuries follow an Indian or Nepalese-influenced Tibetan style of composition. Early compositions are generally characterized as figures placed within strict vertical and horizontal registers and geometric structures. Following that period arose the greatly influential painting traditions of Mentangpa and Khyentse Chenmo of the late fifteenth century. These two artists abandoned the strict compartmentalization of the principal and secondary figures and adopted a floating landscape composition where the figures are placed against an imaginary landscape or open space. The figures are represented as more dynamic, with movement and realistic expression, likewise in the ornaments and dress. Landscape for the wrathful deity depictions is generally suggestive and minimalist. For the peaceful deities and human figures, landscape becomes abundant and varied in the differing painting styles based on the imagination of the artist. A distinction should be made between a painting tradition and a painting style: The first can have many different styles within the tradition and the latter unique to an individual artist or atelier and readily identifiable as a style. "The present Panjarnata painting belongs to the artistic style of a currently unknown artist of central Tibet that has followed in a mixed style of the two principal painting traditions of Mentangpa and Khyentse. The facial features, curled or flowing hair, ornaments, decorations and the small figure vignettes with cemetery scenes are all reminiscent of the Khyenri painting tradition. The robust and wild flames surrounding all the figures is a characteristic of the Mentangpa tradition. In general, the painting follows neither of these traditions or styles specifically because it is a fusion of the two with added and changed elements and characteristics that are unique to the changing times and the style and skill of this unique and unknown master artist." The lot has an estimate of $250,000 to $350,000. It sold for $300,000. "The present painting is of the style associated with the Xumi Fushou Temple in Chengde, outside Beijing. Likely painted in the imperial workshops of the capital for the decoration of the esteemed temple, it belongs to an imperial Chinese school of Tibetan-style Buddhism that flourished in the eighteenth century during a period of cultural interchange between China, Mongolia, and Tibet. "As a newly established dynasty, the Qing, who were themselves Manchus and not of Han Chinese descent, relied on the discipline and support of other foreign ethnic groups, including the Mongolians and Tibetans, for their dominance of China proper. In the pursuit of this goal, the Manchus propagated and patronized Tibetan-style Buddhism. As early as the Yuan dynasty, the Mongolians had relied on the spiritual wisdom of Tibetan Buddhist masters as guidance in matters both religious and secular. They would consult with Tibetan lamas (teachers), for instance, prior to battle, and believed that subsequent victories were the result of their karmic righteousness. In the following centuries, Mongolian adherence to Tibetan Buddhism only increased, and the Qing Emperors took advantage of this devotion by lavishly patronizing Tibetan Buddhist activities in both the capital of Beijing and in areas closer to Mongolia, such as Chengde. "Originally a hunting site, the site of Chengde was chosen for its strategic location north of Beijing, and for its idyllic beauty. It also boasted a massive phallus-shaped rock, known as Qingchui, that was likened to Mount Sumeru, the Buddhist axis mundi. As the Mongols were fervent followers of Tibetan-style Buddhism, the Kangxi Emperor (r. 1662-1722) ordered the construction of various Tibetan-style Buddhist temples ordered around the axis of Qingchui. Under the reign of his grandson, the Qianlong Emperor (r. 1736-1795), the site was expanded massively, with the layout of the site mirroring the Buddhist cosmology of a mandala. Qianlong even ordered the construction of the Putuo Zongchengmiao in 1771, a replica of the Potala Palace in Lhasa, complete with a façade with imitation painted windows, and the Puning Temple, a copy of the ancient Samye Monastery in Tibet. "The Xumi Fushou Temple was completed in 1780, under the orders of the Qianlong Emperor. On the occasion of his seventieth birthday, Qianlong invited Lobsang Palden Yeshe, the Sixth Panchen Lama and the second most important religious leader of the Geluk sect of Tibetan Buddhism after the Dalai Lama, to visit him in Chengde outside Beijing. Like his grandfather before him, Qianlong recognized that the arrival of the revered Panchen Lama to Chengde at the behest of the emperor demonstrated enormous political and religious power in the eyes of the Mongol khans, who were all devout Tibetan Buddhists, and who would also be in attendance at his birthday proceedings. As a fantastic gesture of good will, and a display of his power, Qianlong commanded his architects and builders to replicate the Tashi Lhunpo Monastery, seat of the Panchen Lama in Tibet, in the summer retreat of Chengde. The resulting Xumi Fushou Temple was completed in time for the celebration and the visit of Lobsang Palden Yeshe, and filled with countless paintings, sculptures, and other ritual objects. Unlike the Putuo Zongchengmiao, which while enormous, was largely an empty façade, the Xumi Fushou was a functioning monastery and temple. The Chinese architects, however, could not resist laying out the Xumi Fushou on a processional axis in the Chinese manner and in contrast to the layout of the Tashi Lhunpo, thus obfuscating the aesthetic connection between the two buildings. "The present painting was likely painted in the imperial workshops of Beijing for the decoration of the new Xumi Fushou Temple. The set was subsequently dispersed, and many are now found in museums and private collections. 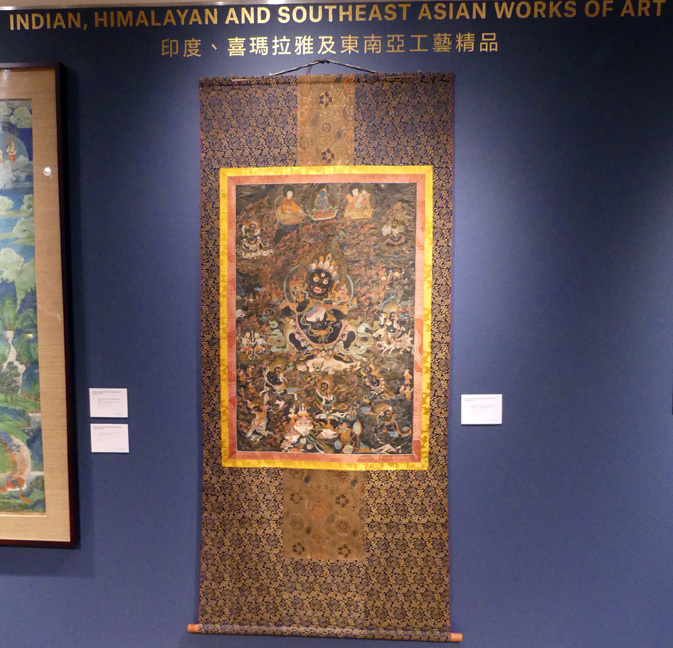 Paintings of Samantabhadra and the Buddha Ratnasambhava (figure a), both from the Xumi Fushou Temple, reside in the Asian Art Museum of San Francisco, while The Philadelphia Museum of Art retains a painting of Sitatapatra (acc. no. 1959-156-4) and a painting of an unidentified bodhisattva (acc. no. 1959-156-5). Two paintings from the same set were sold at Christie’s New York on 12 September 2018, including figure b, a painting of Amitabha (lot 316) and a painting of the bodhisattva Vajraraksha (lot 315). 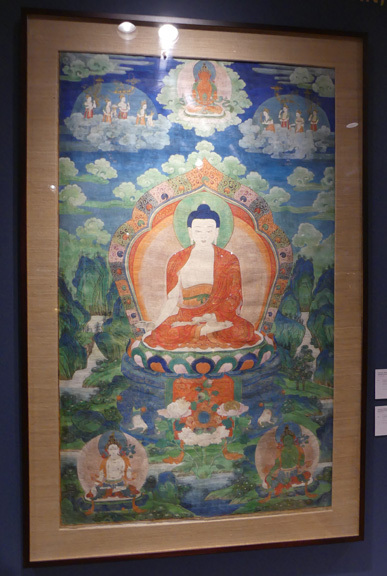 The painting of Samantabhadra in the Asian Art Museum of San Francisco has an inscription stating that it was destined for the Xumi Fushou temple, and indicates its location within the building. "Suvarnabhadra Vimala (Tib. mtshan legs yongs grags dpal) is one of the eight medicine buddhas identified in the Bhaishajyaguruvaiduryaprabharaja Sutra, a sutra of great importance to early Mahayana schools as well as later Vajrayana Buddhist traditions. The jeweled mandorla, ornate lotus throne, pastel palette, and three-lobed style of clouds closely matches that of examples directly attributed by inscription to the Xumi Fushou Temple while the ornamented trees and the cluster of jewels that sit before the medicine buddha reflect the Tibetan influence on this iconography. Blue and green cliffs in a classic Chinese style give way to waterfalls that flow into the body of water from which a lotus emerges with open petals, topped with sense offerings in the form of a conch shell filled with perfume, cymbals, and a mirror. White Tara and Green Tara sit upon lotuses floating over the landscape, while the celestial appearance of Amitayus hovers in the sky above, surrounded by dakinismaking offerings to the bodhisattvas. The flowers that descend from their baskets disappear within the green clouds that fill the space around Amitabha at the center." The lot has an estimate of $80,000 to $120,000. It sold for $100,000. Lot 685 is an impressive gilt bronze figure of "Padmapani Lokeshvara" from Nepal, Early Malla Period, 14th Century. It is 19 7/8 inches high. "Avalokiteshvara, the “Lord who looks upon the World,” is the bodhisattva of compassion, and one of the principle deities in Mahayana Buddhism. Although he has attained enlightenment like the Buddha, the bodhisattva forgoes his escape from the suffering of rebirth to act as a guide to all living beings until they themselves have achieved nirvana. Worshipped in many guises, here he is depicted as Padmapani Lokeshvara, the “lord that holds the lotus.” Like the lotus, which rises from its murky bed below the water to blossom in the pristine air, Padmapani has detached himself from the pain and impurities of the material world and is enlightened in body, speech, and mind. Worshipped in Nepal from at least the mid-sixth century, Avalokiteshvara was one of the most popular Buddhist deities in the Kathmandu Valley. Demand for images of this auspicious bodhisattva was great and from an early period, craftsmen throughout the valley were executing works in wood, stone, paint, and bronze. The deity is nearly always depicted standing, in contrast to the Indian tradition of showing him seated. The style is further characterized by the lithe form of the body and the swaying hips, with the head tilted to the side, resulting in a graceful curvilinear form. The dhoti billows in voluminous folds between the legs and is secured across the thighs with a loosely-draped sash, while the sacred thread hangs from the shoulder across the torso and thighs." The lot has an estimate of $120,000 to $180,000. It sold for $399,000. 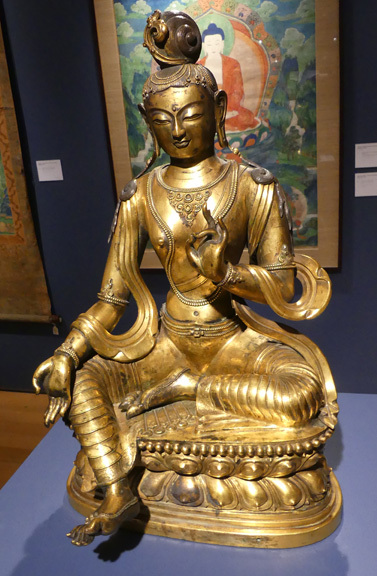 Lot 683, is a fine, gilt-bronze, Eleven-headed Avalokiteshvara from Nepal or Tibet from the 14th Century. It is 7 5/8 inches high. "The current work, depicting an eleven-headed, eight-armed emanation of the bodhisattva Avalokiteshvara, is executed in the iconographic form first described by the Indian Buddhist philosopher Nagarjuna during the second century CE. The form was later popularized in meditational texts by the Indian pandits Bhikshuni Shri and Jowo Atisha, and thereafter absorbed into the essential iconography of Vajrayana Buddhism. The overall proportions including the slim waist and wide hips, the rectangular ushnisha, the U-shaped sash which falls above the knees, and exuberant use of inlaid stone and glass lozenges are all indicative of the Newar idiom, prevalent throughout Central Tibetan ateliers in the fourteenth and fifteenth centuries; while the square facial features and the wide lotus petals on the base of the sculpture are more commonly found in contemporaneous Tibetan sculpture." It has a modest estimate of $25,000 to $35,000. It sold for $68,750. Lot 690 is a handsome repousse gilt-copper figure of Maitreya from Nepal. The 17th-18th Century work is 19 3/4 inches high. It has an estimate of $120,000 to $180,000. It sold for $125,000. Lot 616 is a gilt bronze statuette of Padmapanilokeshvara from Tibet. The 17th Century work is 7 1/8 inches high. "On first appraisal, the present figure appears to be Nepalese in origin, heavily influenced by the Pala style of roughly the twelfth century. 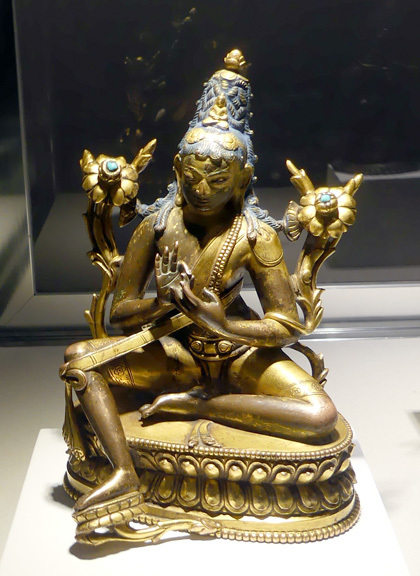 The languid pose, with the incorporation of the yogic band, the tall and relatively flat chignon, the base type, and the heavy lotus stalks at each shoulder, all are hallmarks of the Indian Pala style, while the thick gilting and the incorporation of turquoise at the lotus blossoms are more commonly found in Nepalese and Tibetan sculpture." The lot has an estimate of $60,000 to $80,000. It failed to sell. Lot 674 is a lovely cast and repousse gilt-bronze figure of Green Tara from Inner Mongolia in the Dolonnor style of the late 18th Century. It is 22 7/8 inches high. "The present work was likely created in or around the thriving Buddhist center of Dolonnor in Inner Mongolia. Aspects such as the heavy folds of the drapery, the tall, tightly waisted base, and the curled chignon tied with a floral spray all point to a Dolonnor attribution. 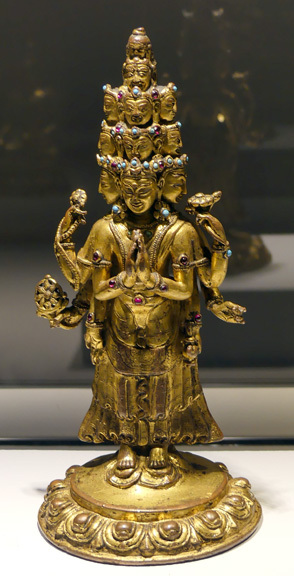 Compare the treatment of the jewelry, particularly the beaded ornaments in the hair, as well as drapery and base with a repoussé gilt-bronze figure of Manjushri in the collection of the Rietberg Museum, Zurich, illustrated by Helmut Uhlig in On the Path to Enlightenment: The Berti Aschmann Foundation of Tibetan Art at the Museum Rietberg Zurich, Zurich, 1995, p. 114, cat. no. 65. "During the Qing period, the Kangxi, Yongzheng, and Qianlong Emperors patronized Dolonnor as a center of Buddhist learning and artistic production. The site was purposefully built not far from Shangdu (Xanadu), the old thirteenth century summer capital of Kublai Khan. The Mongolian lama, master artist, and leader of the Khalka Mongols, Zanabazar, formally assimilated his khanate into the Qing Empire before the Kangxi Emperor at Dolonnor in 1691. 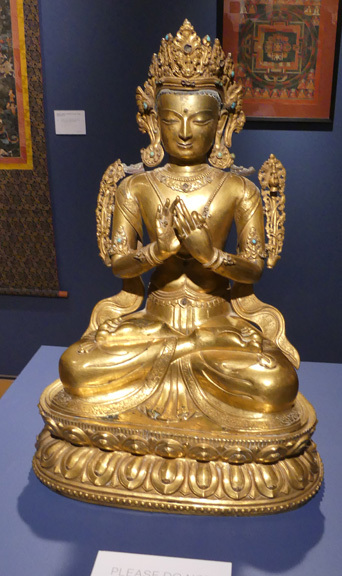 It continued to be an important bronze image foundry even into the late nineteenth century, as noted by the Russian explorer Nikolay Przhevalsky on one of his expeditions to Mongolia in the 1870s...."
The lot has an estimate of $100,000 to $150,000. It sold for $112,500. 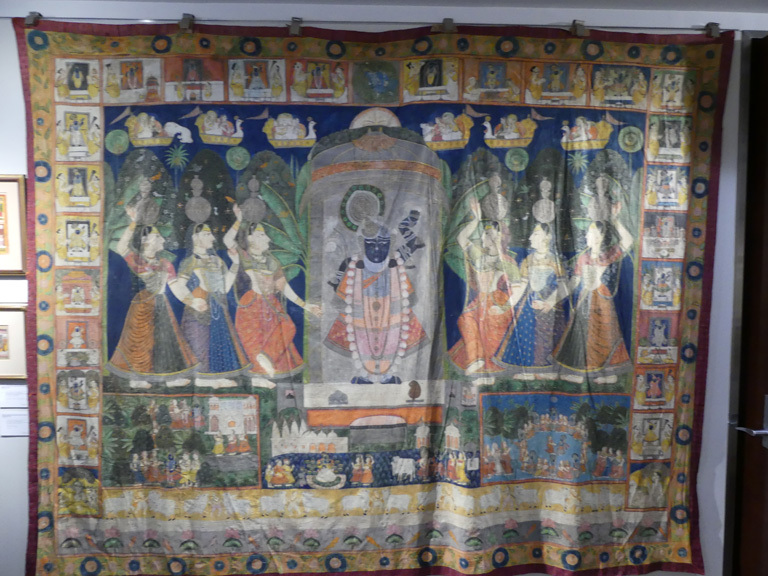 Lot 727 is a fine picchvai of Shri Nathji, opaque pigments on textile from North India, Rajasthan, Nathdwara or Jodpur. The late 19th Century work measures 83 3/4 by 105 1/2 inches. "The festival of Sharat Purnima, depicted here, is a widely celebrated in Rajasthan to symbolize the onset of autumn. Krishna dances with his consort Radha, surrounded by gopis in a celebration of rasalila. A series of interconnected stories are depicted, anticlockwise, from top: six gopis with matkas or pots approach Shri Nathji in the forest with celestial creatures at the top; Krishna multiplies himself to gather devotees and cowherds; Krishna celebrates his victory over the naga or snake, Kaliya; and Krishna dances with gopis to celebrate rasalila. Twenty-six scenes of Shri Nathji’s devotion surround the rectangular borders of the intricately rendered picchvai. Shri Nathji stands in mountain-lifting posture to depict his victory over god Indra, by protecting his people and cattle as Govardhan Nathji." The lot has an estimate of $12.000 to $15,000. It sold for $17,500. 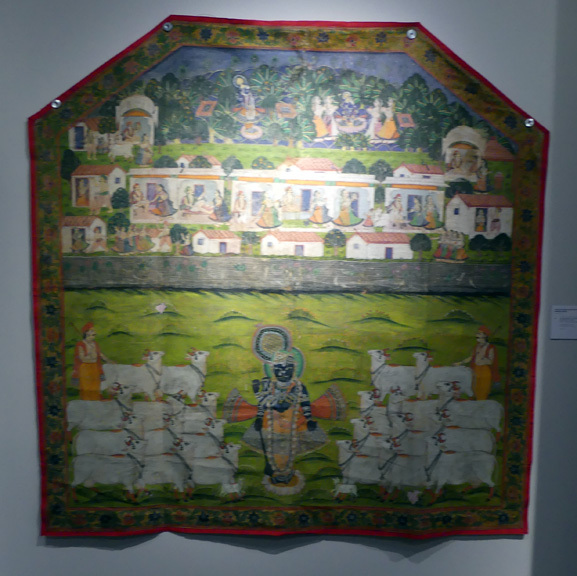 Lot 728 is a good picchvai of "Shri Nathji amongst Cows" from Rajasthan in North India. The 19th Century opaque pigments on textile work measures 56 by 54 1/4 inches. "This picchvai depicts Krishna’s everyday activities as a blissful cowherd in Nathwara, Rajasthan. Gopashtami, a celebration of Krishna’s life as a cowherd, is symbolized in the form of the central scene, which represents Shri Nathji summoning the cattle with his melodious tunes. The topmost scenes represent Krishna’s unique relationship with the gopas (cowherds), gopis (milkmaids), and cattle in the middle of the forest, where gopis engage in Daan Lila or taking of the toll during Ekadashi or eleventh day of autumn. The interesting trapezoidal shape of the picchvai and the bright border with floral motif in bright colors resemble the shape of the main gates of Shri Nathji’s haveli or palace." The lot has an estimate of $6,000 to $8,000. It sold for $6,875.